EMBA Machinery AB of Orebro, Sweden, is a leading, worldwide supplier to the corrugated converting industry and has been producing quality machines since 1954. EMBA machines are renowned for their extremely high productivity and box quality due to very short set up times, accurate print capabilities, high output speeds and outstanding reliability. Based on the patented Ultima™ platform, EMBA machines combine outstanding productivity, flexibility and material efficiency. The non-crush technology preserves the geometry and strength of the corrugated profile for optimum box performance and significant savings in material costs. With an advanced digital communication and an exceptionally user-friendly operator interface, the highly automated and servo controlled EMBA QS ULTIMA™ cuts setting time to a minimum. The machine is designed for maximum production output with shortest set-up time. The world's first non-crush converting machine! EMBA’s true patented Non-Crush Converting™ technology preserves the geometry and strength of the corrugated profile for optimum box performance and significant savings in material costs. 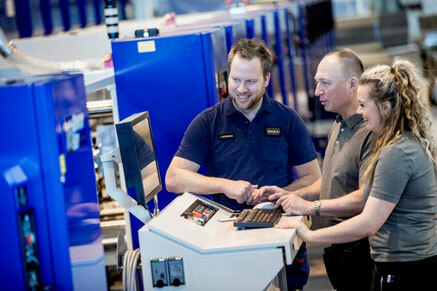 When you invest in an EMBA converting inline machine, you invest in the future! With the EMBA Comfort Programme you can be certain that your EMBA machine will perform to full capacity throughout its entire life cycle, benefiting from the latest know-how and technical innovations. The EMBA Upgrade Programme, featuring the latest technological upgrades from the EMBA research team makes sure it stays that way. When combined with the EMBA Professional, production optimisation is assured. EMBA Original Parts is your guarantee that all spare parts supplied are designed for your EMBA to the most stringent manufacturing specifications and standards for trouble-free replacement. With EMBA Academy you can rely in the knowledge that your EMBA is being operated by EMBA-trained specialists.